Ample Storage—Two large zippered compartments will hold your spare searchcoil, extra pinpointer, snacks, gloves, and various field necessities. Large enough to hold an electronic tablet or laptop (up to 13″ size). Additional Storage—Two small side zipper pouches to hold finds and other small items; one 9-inch-deep zippered accessory pocket to keep important items close at hand; two internal pouches (one zippered) to keep items separated; and one padded divider pouch for notebooks or important papers. Exterior Webbing—MOLLE-type webbing grid can be used to attach accessories and carabiners to secure other items. Side Pockets—Ideal to hold water bottles or your finds. Side Straps—Use to cinch up your pack when you are carrying a light load, or secure your jacket and/or rain gear. Adjustable Fit—Shoulder straps, hipbelt, and sternum strap can be adjusted to provide greater comfort for your load. 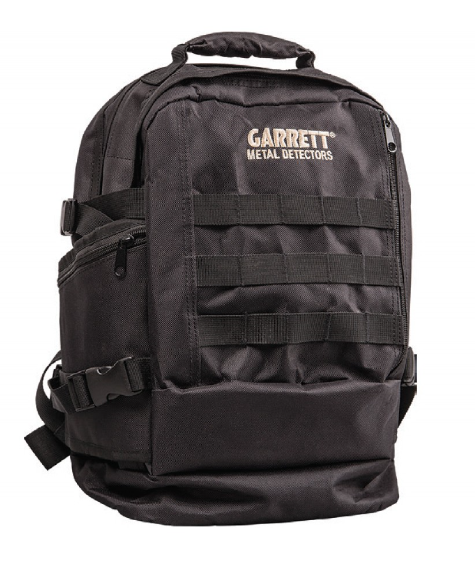 Padded Back—Provides additional comfort for heavier loads. Includes luggage sleeve that allows daypack to easily attach to rolling luggage handles. Hideaway Hipbelt—Waist belt helps keep pack properly positioned during long hikes. Belt can be hidden away with Velcro flap on back of pack when not in use. Specialized Features—Internal sunglasses pouch at top of inner compartment; reinforced carrying handle; internal hook for attaching car key ring.